The National Endowment for Democracy (NED) is pleased to announce its Spring 2019 cohort of Reagan-Fascell, Visiting, and Hurford Youth Fellows. 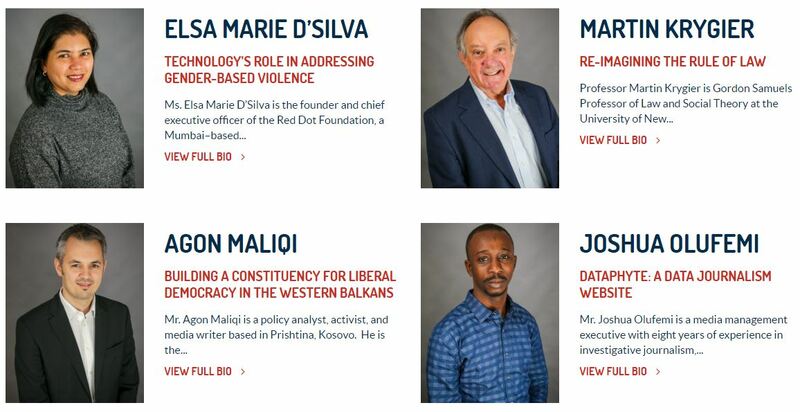 In residence are leading democracy activists, practitioners, journalists, and scholars from a wide range of countries, including Australia, Georgia, India, Kosovo, Nigeria, and Uganda. Named in honor of President Ronald Reagan and the late Congressman Dante Fascell (D-Fl. ), whose bipartisan vision led to NED’s founding, the Reagan-Fascell Democracy Fellows Program seeks to expand the knowledge, broaden the perspectives, build the capacity, and boost the morale of some of the world’s most committed and courageous democracy advocates. Based at the International Forum for Democratic Studies, a leading center for analysis and discussion of the theory and practice of democracy around the world, the Reagan-Fascell program has enabled more than 300 fellows from over 90 countries to deepen their understanding of democracy and enhance their ability to work toward democratic change. The Hurford Youth Fellows Program seeks to build the leadership skills, enhance the organizational talents, and harness the potential of emerging democracy leaders from around the world. The program is based at the secretariat of the World Movement for Democracy and is supported by the Hurford Foundation.